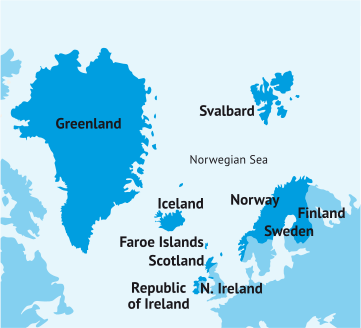 GREBE is one of several programmes funded by the Northern Periphery & Arctic Programme. The NPA is one of fifteen transnational co-operation programmes set up to encourage and support transnational cooperation between NPA programme areas in Europe. The Northern Periphery and Arctic 2014-2020 forms a cooperation between 9 programme partner countries. The NPA 2014-2020 is part of the European Territorial Cooperation Objective, supported by the European Regional Development Fund (ERDF) and ERDF equivalent funding from non EU partner countries. Despite geographical differences, the large programme area shares a number of joint challenges and opportunities that can best be overcome and realised by transnational cooperation. It is the programme’s vision is to help to generate vibrant, competitive and sustainable communities, by harnessing innovation, expanding the capacity for entrepreneurship and seizing the unique growth initiatives and opportunities of the Northern and Arctic regions in a resource efficient way.